Van Den Abbeele is one of six 2008 medal winners; the other honorees include professors from France, Italy, Germany, and the UK in the fields of physics, biology and life sciences, mathematics, material science, and computer science. The European Academy of Sciences is a nonprofit, non-governmental, independent organization of distinguished scholars and engineers engaged in research and development of advanced technologies. The Blaise Pascal Medal was established in 2003 to recognize an outstanding and demonstrated personal contribution to science and technology and the promotion of excellence in research and education. The academy is based in Belgium and will hold an awards ceremony at the Palace of Academies on November 7. Van Den Abbeele said he intends to travel to Brussels to accept the medal. "I am very honored and thrilled," said Van Den Abbeele. "Receiving this honor in Belgium has particular resonance for me since I was born there." Van Den Abbeele was selected for the honor "in recognition of his outstanding contributions to the rethinking of human and social studies in a contemporary context, including philosophy, anthropology and the impact of cognitive studies on the 'digital divide.' " He was also recognized for his original research on comparative francophone cultures and on the history of the idea of Europe. A scholar of French literature and philosophy with a wide expertise in public humanities programs and education, Van Den Abbeele became dean of humanities at UC Santa Cruz in 2006. Prior to that, he spent 15 years at UC Davis, where he was a professor of French and Italian, as well as director of the Davis Humanities Institute and the Pacific Regional Humanities Center. 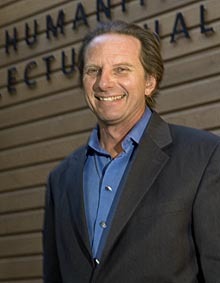 From 1999 to 2007, Van Den Abbeele also served as president of the Western Humanities Alliance, a growing consortium of 23 West Coast universities.